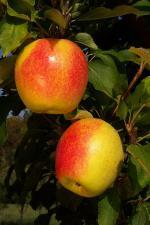 Rhode Island Greening is one of the best American culinary apples. Described by William Kendrick in his book The New American Orchardist (1833) as "... tender, rich, juicy, of an agreeable flavor in which acid predominates" - an excellent summary of the key attributes of a good kitchen apple. 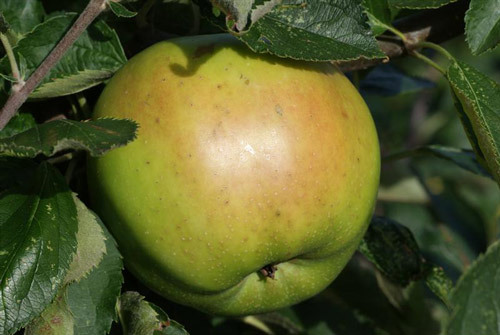 Along with Roxbury Russet, Rhode Island Greening is generally considered the oldest apple variety in North America, with records going back to the 17th century. Whereas Roxbury Russet has only recently come back into favor, Rhode Island Greening has always been a popular variety with many commercial plantings - largely because apple pie made with these apples is very hard to beat. Rhode Island Greening trees are notably long-lived (a characteristic shared with the English Bramley, which like Rhode Island Greening is also a triploid variety).